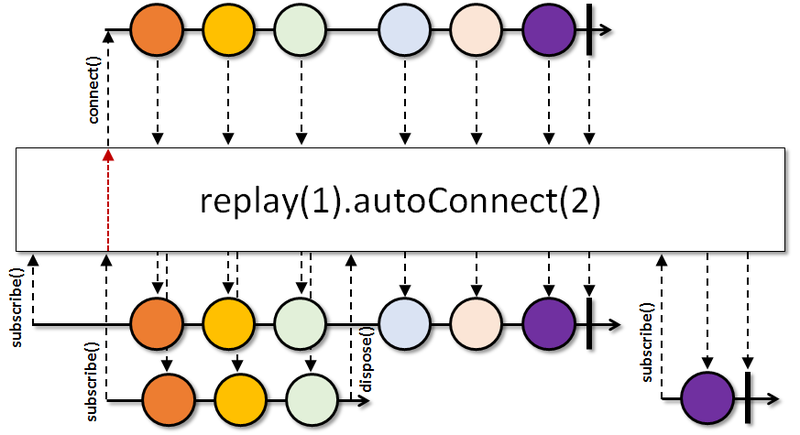 A ConnectableObservable resembles an ordinary Observable, except that it does not begin emitting items when it is subscribed to, but only when its connect(io.reactivex.functions.Consumer<? super io.reactivex.disposables.Disposable>) method is called. In this way you can wait for all intended Observers to Observable.subscribe() to the Observable before the Observable begins emitting items. Returns an Observable that automatically connects (at most once) to this ConnectableObservable when the first Observer subscribes. Returns an Observable that automatically connects (at most once) to this ConnectableObservable when the specified number of Observers subscribe to it. Returns an Observable that automatically connects (at most once) to this ConnectableObservable when the specified number of Subscribers subscribe to it and calls the specified callback with the Subscription associated with the established connection. Instructs the ConnectableObservable to begin emitting the items from its underlying Observable to its Observers. Connects to the upstream ConnectableObservable if the number of subscribed subscriber reaches the specified count and disconnect if all subscribers have unsubscribed. Connects to the upstream ConnectableObservable if the number of subscribed subscriber reaches the specified count and disconnect after the specified timeout if all subscribers have unsubscribed. Connects to the upstream ConnectableObservable if the number of subscribed subscriber reaches 1 and disconnect after the specified timeout if all subscribers have unsubscribed. To disconnect from a synchronous source, use the connect(Consumer) method. The connection happens after the first subscription and happens at most once during the lifetime of the returned Observable. If this ConnectableObservable terminates, the connection is never renewed, no matter how Observers come and go. Use refCount() to renew a connection or dispose an active connection when all Observers have disposed their Disposables. The connection happens after the given number of subscriptions and happens at most once during the lifetime of the returned Observable. 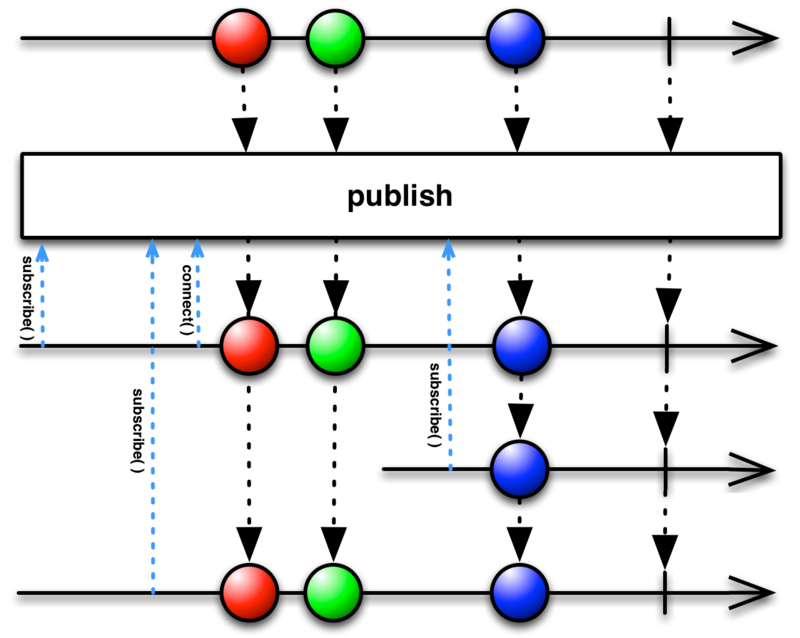 If this ConnectableObservable terminates, the connection is never renewed, no matter how Observers come and go. Use refCount() to renew a connection or dispose an active connection when all Observers have disposed their Disposables. numberOfSubscribers - the number of subscribers to await before calling connect on the ConnectableObservable. A non-positive value indicates an immediate connection.